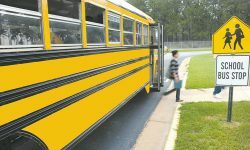 A lack of bus drivers has been seen across the country, particularly in New Hampshire, which has many rural communities and a low unemployment rate. A new Tennessee law which was passed following a deadly 2014 accident has drastically increased school bus driver penalties for using an electronic device. How can you keep students safe on buses when they’re on the way to and from school? In total, the governor has vetoed $56.4 million of the state’s $8 billion budget. Although school buses reduce student absenteeism, some districts are cutting these services. The driver of the bus had a medical emergency and lost control of the vehicle. The surveillance system will be paid for by the Hawaii Department of Education. Here’s the latest legislation affecting campuses along with some of the possible reasons for their passage.